"A friend of mine requested a tres leches cake that wasn't soggy but full of flavor that could be decorated. This is what I came up with. 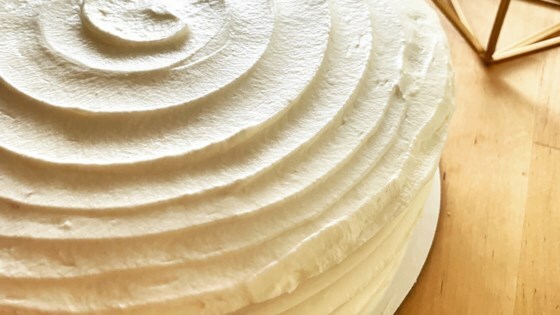 Fill cake with vanilla cream mousse filling and top with your favorite buttercream recipe. You can also make a 9x13-inch sheet cake and soak with the tres milks, cut into individual servings, and top with mousse rosettes." Spray 2 9-inch round cake pans with cooking spray. Mix white cake mix, flour, eggs, sugar, canola oil, 1 teaspoon vanilla extract, baking powder, and milk in a large bowl until thoroughly combined. Pour batter into prepared cake pans. Bake in preheated oven until the cakes are lightly browned and a toothpick inserted into the center of the cakes comes out clean, 40 to 50 minutes. Let cakes cool about 10 minutes in pans before removing to finish cooling on racks. Whisk evaporated milk, sweetened condensed milk, 6 tablespoons cream, 1/2 teaspoon vanilla extract, and coconut extract in a bowl until smooth. Refrigerate the tres leches mixture. Beat 2 cups cream with instant vanilla pudding mix in a separate mixing bowl with an electric mixer until soft peaks form, 3 to 5 minutes. Refrigerate mousse filling. With a long serrated knife, lightly cut off a thin layer of each cake top to level the cake. Place cakes, leveled sides up, on pieces of waxed paper. Poke holes all over the cakes with a skewer. Slowly pour the tres leches mixture over the cakes, about 1/2 cup at a time, waiting until the mixture has soaked in before continuing to pour on more milk mixture. Wrap cake layers in plastic wrap; refrigerate until chilled, at least 4 hours. Unwrap a cake layer and place onto a serving platter with leveled side up. Top the cake with mousse filling; gently place second cake layer over the filling with leveled side down. Refrigerate leftovers. A tropical cocktail in a cake! Partially freezing the cake layers makes it easier to assemble a layered tres leches cake. Aluminum foil helps keep food moist, ensures it cooks evenly, keeps leftovers fresh, and makes clean-up easy. delicious reciepe......I made this for a MOTHERS DAY celebration......Everyone loved it!! It was ok. I didn't care too much for the taste of the cake. I think the texture of this cake recipe is really good for cake of filling. Also I didn't care for the vanilla pudding in the topping. Huge hit at work! Will definitely do this one again!